The Races – The Bird and the Bee. With a few hours left before Mark Greenwood concludes Lad Broke I return to the site, to see Greenwood finish the course set out for himself. Something in the back of my mind understands that this course will be undertaken with or without my presence. The plummy voice emanating from the vinyl suggests that ‘the race is the thing’; it seems apt. After a few moments Greenwood begins to reconfigure the space taking the newspaper pages from off the floor and hangs them along with the betting slips. The space is being prepared, for what, I am not exactly sure. I slip out for few moments. When I return the main difference is that two sheets of racing papers remain on the floor weighted down by two large tin cans, hinting at some kind of ceremony to come. A sensation confirmed by the presence of the Redrum horseshoe in-between the pages. Greenwood is at his task of filling out the betting slips. With the knowledge that we are entering the last hours of the performance I feel my focus shifting from his current actions to his future actions. One those actions is to open the tin cans which reveal themselves to be full of dog food. Looking at the solid brown in the cans I can’t help but think of these cans as symbols of the cost of failure for both the horse (that urban myth about old or failing horses being sold for dog meat) and the gambler (finding themselves in self-imposed poverty turn to the cheapest source of protein). Both of them caught in a fatalistic process where the worst possible outcome will lead one to feed on the other. Alongside these tin cans Greenwood carefully lays down gambling play sets. Bright oblongs of paper are set down the edges, a reference I wonder to the attitudes a hard-core gambler would have towards money. After this Greenwood returns to his stable and sups a beer and waits for what? He begins to strap a betting receipt to his head and sits in quiet contemplation. Or should that be in quiet desperation? Can a gambler see beyond his need for gambling, is the act of gambling more precious than the myth of winning and losing? These are the questions that fill my head as I wait. In this time I also reflect on how my viewing of this piece has changed, I have been less inclined to explore the space, and have taken up a relatively still position as the narrative unfolds. I feel a tension, not the threat (or promise) of violence I felt on entering the space yesterday, rather one of expectation. Maybe this is how gamblers feel a sensation of dead expectation. Something happens, I almost miss it, Greenwood has begun to chew through the receipt strapped to his face. It seems that consumption is a motif running through this part of the performance, but what, or who, is being consumed? Speaking of consumption, Greenwood has taken the dog food tins and is now plopping out the contents onto the sheets of paper. An act which makes it look more like its end product rather than a tasty treat. The tins have been evacuated, he pis*es into each of them before setting down by the sloppy piles of meat. Greenwood then returns to his table, using the discarded pens to construct a tower, which he then places delicately into the pis* cans. These seem to be acts of breakdown and desperation a perversion of the measured movements which have preceded it. Greenwood is presenting a more degraded figure then yesterday when he appeared to be more belligerent. Especially after the desperate construction of this tribute having been moved into the position of creating this shrine to the last remains of hope using the only materials to hand. There’s a sense of things falling apart, as Greenwoods snaps the lines holding up the betting slips which come zipping and crashing to the ground. It’s an oddly joyous, comedic moment, the relief found in knowing you’re failing. He retires to the back wall which now appears to be quite stark where he begins to carve something into his body. With some difficulty (due to the sharpness of the blade), he carves the word LAD into his chest, the most disturbing aspect of this isn’t the actual cutting but rather the quietness with which he enacts it. After this he retrieves the Redrum horseshoe and begins to nail it to the wall, upside down, allowing all the luck to drain from it. Once this act has been performed he stands with his back to us, and using his bloody fingers, smears the word BROKE on the wall. Eventually he turns around and slumps to the floor, all the projected, imagined violence crumpling away in an act of apparent self-pity. Though there’s still a sense of expectation, surely there’s nothing left. As Greenwood squats there I ask myself what I am to do now. Take judgement on this figure on the floor? And is it truly over? There are twenty minutes left to run and we seem to have entered into a staring contest to see who’ll break first. 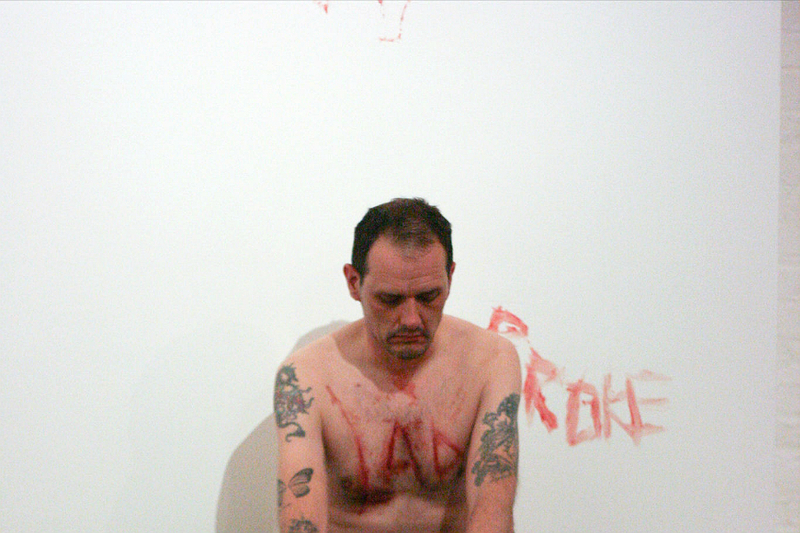 As with many durational pieces like this, as much is asked of the viewer as of the performer. Throughout I have willingly engaged with the narratives set out for me. I think about the nature of my role in the whole endeavour, as what? Passive observer or enabler? Inevitably perhaps, this leads to questions regarding my role and actions in general. One thing I know for certain, this has been as much an intellectual exercise as it has an experience. Greenwood and Mercy have presented something of scope and ambition, a performance that relates not only to contemporary issues also recalls the heady early days of live/body art of the seventies. Their efforts will hopefully lead to the creation of similar events in the city in future.